I sew. Lots. Almost everyday. 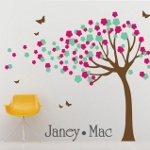 Only 10 percent of what I make ends up in my etsy shop. The rest goes on me, my kids and some very choice friends and family. If I had a dog, I'd probably sew ridiculous outfits for it too. Man, it would be one lucky dog. Pin It Now! I wanted a wallet that carried a lot of cards with no risk of them sliding out. As you can see, the card slots face inward, which means your cards will stay put as long as your wallet is closed. I promise it's a lot easier than it looks so bear with me. Here we go! Disclaimer: I do not mind if you use this pattern for personal use, or even to sew and sell on a small scale. However, please do not sell the actual pattern for profit... it is for everyone to enjoy free of charge. Note: you only need to use interfacing for quilting weight cottons. If you decide to use canvas or heavy weight fabric, forge ahead! Make the tab. Stabilize with fusible interfacing. Fold in half and sew the top and side, leaving bottom open. Clip corners, turn right-side out, press and top stitch. Note: If using a magnetic purse snap, attach before sewing tab. Make the lining. Lay pieces right-sides together and sew sides and bottom, leaving 3" opening at bottom. Top is completely unsewn. OPTIONAL: You may skip this step if you want a plain wallet. I embellished this one with ribbon. Lace would be adorable. Also, a quilted patchwork piecing would rock... piece together first then interface finished piecing. Don't use a credit card. It will warp your card and flatten your numbers. Just take my word for it. I used a gift card. Never iron directly on the card. Think of folding a paper fan... only it's off-set in its folds to create the staggered pockets. I mostly just eye-balled this part. Nice pockets. Now flip it over and trim off the excess. Each finished pocket piece should measure 4" x 5". Now do it again for the other pocket piece. Attach your pocket pieces to the inner wallet piece. Center and attach the tab. Sew your outer wallet and inner pocket pieces together along sides and bottom. You're sewing through some thick layers, so use a 1/2" seam allowance to make sure you catch everything. Then trim down as shown. Sew lining to main wallet. Fold bottom of outer piece an inch so it'll fit in the lining pouch. Sew around top opening. This is a bit awkward feeding through the sewing machine. Use a 1/2" seam allowance here as well. Crisp corners of outer wallet well before stitching lining closed. Work your magic with the iron and press those stubborn, thick seams. Top stitch around entire opening. Give your wallet another good pressing and top stitch along the sides and bottom. Attach snap. I have an industrial snap press, but you can use sew-on snaps or Velcro. If using magnetic purse snaps, you'll want to attach the snap piece to the tab before sewing the tab. Just what I needed! Thanks for sharing your tutorial, it's great and I'll give it a try. Oh how love this little wallet! Thanks so much for sharing! Your tutorials never disappoint!!! Thanks so much! I have been looking for this exact type of wallet - THANK YOU so much for sharing!!! I can't wait to give it a try! Great tutorial! Now I know what to sew next! Funny, I think I just saw this pinned on pinterest. Looks great. Perfect sized wallet for my needs. I have a coach one I use all the time, but it would be great to make a wallet to match all the bags and purses I make! Thank you so much! Lovely! Thank you for taking the time to do this tutorial! I love it! It's fantastic! thank you very much for your good tutorial. Great tutorial! I sew very little but I ma very confident that I could do also, your instructions are so easy to follow. You could also add a zippered pocket on the other side for small change. Thank you so much, great little last minute gift for my little sis!! Thanks for the great tutorial! This is definitely on my to do list! Wonderful tutorial!! 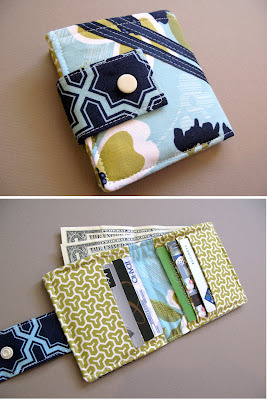 I love this wallet and have been needing to make one this size :-) I have a quick question - if you choose to use a velcro closure, at which step would you sew that onto the outer piece? Thanks so much for posting! Hi Becky, I would add the velcro piece to the outer shell in the first step, after you stabilize it with interfacing (but before you sew it to the pocket piece). For the other velcro piece that goes on the tab, I would wait to sew that very last (after the wallet is finished). Happy sewing! This looks amazing, can't wait to make it! Just stumbled upon your tutorial. From the bottom of my heart - thank you for sharing your talent and instructions. This is the first step-by-step tutorial I have found in my numerous searches. Thank you for posting this. It's just what I need. I just started sewing and your step by step instructions will totally help me. WHAT FUN! I just finished making my first one and can't wait to make another. Your instructions & pictures were perfect! The only change I made was attaching the tab to the right instead of the left side. Thank you so much for sharing your pattern! side wallet piece before you put the lining in and sew. I should have thought of that. Oh well- now have a snapped-in lining! not bad for my first attempt. I found this on a friend's pin and made one this evening. Turned out pretty good. I, too, have a snapped lining but that doesn't matter. Cute! My wife is horrible with a sewing machine, I have been sewing ever since I was a private in the Army. This was one of the easiest tutorials to do with lots of room for error. Thanks for the post my wife loves Her new wallet. 1/2 way finished....super easy - using velcro....my daughter found this and sent it to me with the following comment..."Do you think, maybe?" She will be surprised next weekend! Thank you...looking forward to trying some of your other items. Love the way this came together! Took most of the morning and loved every minute of it! I really enjoyed your tuto and made a little wallet with external simili leather. But as usual I cut some edges and the cards are slipping a little bit too fast out of their storage. I like the way to put it together and really want to thak you for showing it, your explanations are really clear. This wallet was my first project... ever. The tutorial was very clear and easy to follow, I love my new wallet, thanks for sharing! oh lawd how i did try, mine camout with holes on each side and no bill thing lmao idk??? CUTE wallet! This is just what I'm looking for - my husband likes to take me out on his motorcycle when we have our dates, and I need a cute little something to keep my things in. Thanks for sharing the tutorial! but i think its a bit too complicated for me. have to start with something easier. This is just what I have been looking for. I am going on vacation next month and I don't want to take my large wallet and all my cards. I just need to add some sort of pocket for change. I am going on vacation next month and I don't want to take my big wallet with all my cards. This will be perfect for what I need. I just need to add a zippered pocket somehow for change. i've been needing a new wallet. thanks for such a great tutorial!! I just made this wallet and have to say its very cute! Is a little tricky in some parts but definitely worth the few hours I put into it. Hopefully the next one I make will b easier since I now have experience ;-) Hehe. Thank u so much for the free tutorial!! LOVE this tutorial! Thank you so much. I just made my new wallet this a.m. My only issue (which isn't a big problem), is that the center (where you sew the liner to the credit card holder) is too thick and sticks out (in my opinion). What did I do wrong? I trimmed all seam allowances as much as I could. Love this wallet! It is difficult to stitch the outer edge when it is completed though. I added a Velcro change compartment on the outside. I measured a piece 9 by 5 inches, folded it in half, right sides facing each other and stitched two sides and turned it right side out. Then I added Velcro to one long side and added the other half of the Velcro to the outside of the outer piece and sewed down the change purse. All this was done before any assembly was started. Just make sure you attach it to the back panel side where the tab is so it isn't in the way when you snap it close. Hope that makes sense. I used my snap press to attach the snap. The male end is tucked inside the money holder and it helps hold down the fabric too. Nobody can see it unless they look in the money compartment. Looks like a lot of people will be getting wallets for Xmas this year! This is a very nice project. I finished one very quickly and think I will add some quilting to the next one. I just made a Spiderman wallet for my son's birthday using your tutorial. I changed the measurements so it would fit in his pocket and it turned out great! Off to Hobby Lobby now so I can make myself one. Thank you so much for sharing this great tutorial. I've been looking for one just like this. Can't wait to get started on it. I've made a couple of these wallets and have had some trouble fitting the lining in. If I sew it according to the 1/2 " seam allowance, the main wallet is too big to fit inside (before it gets turned right side out). If seam seams a bit smaller, then when it is turned the bill lining is too bunchy. Anyone else have same trouble? Thanks so much for this. I have made a wallet for myself on a much simpler tutorial, but I am making one for a Christmas gift and this will give it a much crisper look! I also favorited you on etsy. Your clothes are beautiful. I hope my stitches stay as straight as yours. 1) cut your interfacing smaller, 8"x4", then center it on the back of the main wallet pieces. This should reduce much of the bulk on those edges. 2) Continue to use the 1/2" seam allowance, but then trim down the seam to 1/4" and clip corners after sewing. I was so excited when I found this tutorial. I was going to make my husband a wallet! The tutorial was WONDERFUL! A word of caution: I used all duct cloth, canvas, and even put interfacing on the outside piece...way too thick! He will not use this wallet. This tutorial was Über helpful! I whipped one up for a last minute Christmas gift and even as a beginning sew-er I was able to get this done in no time at all. And it looks adorable! THANK YOU! Did I miss seeing the seam allowance guide? @ Judy Creates - The seam allowance varies from 1/4" to 1/2", and is indicated on the picture when you enlarge it. The tab uses a 1/4". The main wallet uses a 1/2" (then you trim down to 1/4" after it's sewn to reduce bulk). Stay stitching the pocket is 1/4". Any topstitching is 1/8". Best of luck! Thanks, I completed the wallet it is really cute. I added the magnetic snap and determined that the snap side should be sewn on facing down. Also the coordinating snap should be centered about 2 inches down on the short side. Saw the wallet weeks before Christmas but just never got it done. Today I finished it in a little over 3 hours. Great Sunday project, thanks and love your site. Easy instructions. I whipped out two of these with some scrap bull denim I had laying around. I'll definitely be making more of these as gifts. Sweat idea!! I always have a hard time finding a wallet that I like so I'm going to start making mine. I already make most of my totes & make up bags why not my wallet. Thanks for such a great idea!! I just finished making one of these adorable wallets and am super happy with it! I will be making more for sure! Thank you so much for a wonderful pattern!! Just made this today. Turned out great! Thank you so much! Cool iron dude! where'd you buy it? I'll pay you 5 bucks for it! This is awesome! Can customize a wallet that will actually fit into my daughter's tiny little purses! Thanks soooo much for sharing your wonderful idea! My daughter found your pattern on pintrest and had to try it out. After hers turned out so very cute, I had to make one. My daughter is 15 and enjoys sewing but has just really caught the bug. She followed your instructions and had no problems finishing it very quickly. Thanks for your creative blog. Anyone who has made this according to the pattern, what are the approximate dimensions of the finished wallet? I think I may want to scale it down some. How much of it could be tightened up and still fit the cards and bills? Thanks! @ Anonymous - The finished dimensions are 4"x4" when the wallet is closed. As for the card slots, you have about 1/4" total wiggle room (side to side), and about 1/2" vertical, so I wouldn't go smaller than 8.5"x4.75" when cutting your main outer piece and lining piece. As for the card slot piece, you'll want to keep the vertical spacing when creating the pockets, but the 1/2" wiggle room comes by shifting the pockets closer to the center fold of the wallet. (cut 4.75"x 19"). Hope this helps! Just made this today! Super easy to follow, love my new wallet, thanks for the awesome tutorial! I love this wallet and made a bunch of them. Any suggestions how to keep the credit cards from sliding out so easily? They just glide on the fabric and slip out when I open the wallet. Née something with a rubber surface that has one side adhesive. Any ideas? I just made this today! It was very simple and the tutorial was well put together :) Thank you so much for this post. I just finished this today! Thank you so much. Your tutorial is great. The instructions were clear and easy to follow. I just have to say, as a Boise-area native living in Utah for 10+ years now, seeing your Boise Co-Op card made me really happy! Looking forward to trying this tutorial. WONDERFUL tutorial! I just finished a wallet for my mom - she's been looking for something similar to buy and couldn't find the right thing in her price range. Mine is not nearly a "finished" looking as yours but that is completely due to my sewing skills. On my own I would never have attempted such an endeavor! I can't thank you enough! Thank you so much for posting this tutorial!! It was great!!!! Great peaces of work. I love it. thanks for sharing a great tutorial..
Delightful share, Jodell...wonderful inspiration. will email u what I'm able to produce from your guidelines,k? You are so awesome, very easy to follow step-by-step instructions. Thank you for inspiring me artful muscles. I just made two of these! Super easy and comes out so nice! Thanks for the tutorial. These are so easy to make. Hi, what kind of stabilizer would you recommend using? Would Pellon 71F be too thick? Thanks for the tutorial. 1. only use the heavy interfacing on the outer piece. Use light or mid weight for the inner piece. 2. cut your interfacing minus the seam allowance... so cut it 8"x4" - then center on the back side of your 9"x5" outer piece and fuse. This will avoid the extra bulk on the seams. Hi, thanks for your reply about stabilizer. May I have another question (can you tell I am getting ready to make this?) -- you don't laminate your fabric, right? Are you concerned that the wallet will get dirty over time? would you wash it? I am wondering if I should apply iron-on vinyl before sewing. @Anonymous - I haven't tried making this wallet with laminated cotton. It would certainly keep it cleaner :) I haven't tried washing my cotton wallet yet, but I imagine you could as long as you hand wash, cold water, and lay flat to dry. If you decide to try laminate cotton or oil cloth, just keep in mind to "finger press" your seams and avoid ironing so the laminate does not melt. I would also only do laminated cotton on the outer layer and leave the inside layers and pocket regular cotton. Good luck! I made a purse yesterday and today using this tutorial I made a matching wallet. I love it! The tutorial was easy to follow and the wallet is fantastic with just the right amount of pockets! Thank you for sharing it! Great tutorial, great pattern. Thanks so very much for sharing it! Thank you so much for sharing.Loved ! Cute wallet! Would you mind telling me what industrial snap press you use? I'm having trouble figuring out which ones can use these kinds of snaps and not just the snaps that go on diapers. Thanks! @Anonymous - I purchased my snap press and die set years ago from here http://www.verybaby.com/snap-press/. I have a couple of friends that also use the snap press from the snap store and love it. This was a great tutorial. Thank you for sharing, I love my new wallet. Super cute! Planning to make this either this week or next week! Thanks for the tutorial! Thank you! 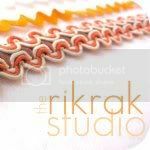 Your tutorial just helped me figure out something I've wanted to incorporate into my own wallets! Thank you so much! Fun tutorial thanks for sharing :)! I skipped the second card slot piece and put in an invisible zipper pocket instead. AWESOME!! Due to disability, my 'regular' handbag has become unmanageably heavy - so I just made a lightweight bag of my own design (upholstery fabric)- but my leather wallet weighs a TON before I even put anything in it!! I'll be using your design with the possible addition of a another card wing to hold more plastic - Thank you for your hard work producing this! Very interesting tutorial. Nice idea with a ribbon. I think, I will try to sew next wallet myself. When doing the final top stitching on the sides and bottom, are you leaving the bill pocket inside so it gets stitched? or do I pull the bill liner out and topstitch just the wallet? How did u know where to attach the metal snap so both sides would meet correctly? thank you for this tutorial. i love the way my little wallet turned out ! This worked perfectly! My nephew and I put it together in only 2 hours! Thanks so much! I am new to sewing and have a question about the tab. You say to cut a piece for the tab that is square 3 1/2 x 3 1/2 I believe and in the picture with all your cut pieces it is square but in the next picture it is a rectangle and seems larger than what you say to cut it. Could you explain to me what I am not seeing :) Thank you... It is adorable!! I feel pretty dumb for having to ask this, but is it in inches or centimeters? Thanks! with great photos and instructions. Thank you for sharing! If I want to use a snap tool, should I add the snap to the body before I add the pockets? @Lauren - You may add the snap before, but I just add it at the end by spreading open the bill fold. (the snap will go on the opposite side of the pockets). This is awesome!! Thank you for making this free!!! My wallet turned out so cute, this is just what I needed!!! As a rookie sewer, I have a couple of questions. I've watched tutorial after tutorial and take Craftsy class after class, but these tutorials/classes never address things such as, needle size, stitch, how to keep the fabric from moving when sewing, etc. So what size needle and stitch should I use? I'm using stabilized quilting fabric (cotton). Also, even when pinning, often times, my fabric moves creating uneven sides. I'm using a zig zag foot/standard and tension set to 3 ( maybe, 2). Is there a trick to keeping things lined up? @Misty Guye - for needle size, I prefer Universal 80/12 (Schmetz Brand are my favorite). As for your fabric layers shifting, pinning is good, but it also sometimes help to hold fabric a certain way as you sew to keep them all together (especially when you have heavier layers that want to misbehave). With your left hand, grip the just sewn fabric, and with your right hand grip about 4-6 inches of the unsewn part. Using this grip, pull the fabric layers taut as you sew. However, it is important that while you are holding the fabric taut, you do not force (pull) while you sew. The machine should be doing the feeding, while you just "guide" the fabric while holding it tight. I hope this makes sense :) Good luck! I love the tutorials on wallet, just curious about the durability of the wallet. Thank you for the tutorial! It was easy to make, mostly. I had some difficulties with it be very thick in some areas and I had some difficulties with that. Unfortunately, I found this isn't the style of wallet for me. It seems a bit too big and a little loose. Good practice though! Thanks. My daughter looks forward to making it. Like Shirley, I followed all cutting/seam allowances but when I insert the completed outer section into the liner, it sticks out a good half inch. Even if I reduce the seam along the bottom of the liner it's not going to work, so I have to cut more fabric. Thankfully I have extra, but I wish I could figure out what went wrong. Otherwise it seems to be looking great; just hoping I can fix this and finish it up before I lose patience and/or enthusiasm! Love this type of wallet - made one with scraps to try it out and other than the sewing of the lining it was a breeze"